A lost British army patrol in WWI Mesopotamia is gradually picked off one by one in this suspenseful thriller. ‘Already loose sand had drifted over the stamped-down square which momentarily had distinguished the subaltern's grave: no there was no sign, no mark, no indication whatsoever. There had been, here, eleven men. Now ten rode away' In the Mesopotamian desert during World War I, the leader of a British patrol is shot and killed, by an unseen enemy. The officer is the only one who knows their orders and has not told anyone else where they are located. From then on the sergeant has to try to lead the men through a hostile desert landscape which is full of invisible Arab snipers. One by one they are picked off, and the group of diverse characters from different backgrounds has to try to come together in order to survive. The decision making process proves far from easy as tensions and prejudices from their former lives come to the fore. This thrilling tale of suspense goes right to the last page and was a best seller in the 1920s. 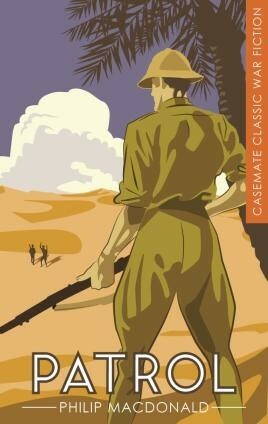 The novel was filmed twice, by Walter Summers (as Lost Patrol in 1929) and by John Ford (as The Lost Patrol in 1934). It works perfectly well as a suspense-driven thriller, but it also tells us something as a historical document. Written in 1927 by Philip MacDonald, one of the most popular authors of inter-war potboilers, it has the whiff of authenticity about it, and with good reason. MacDonald served in Britain's largely calamitous Mesopotamian campaign during WW1 and Patrol (with its story of a directionless, doomed mission) seems to be his angry response to that military misadventure. The basis for films by Walter Summer and John Ford, this bestselling novel is a suspenseful tale of the Great War for readers of Robert Graves or Ford Madox Ford—or anyone who enjoys an action-packed war story. Author Philip MacDonald, who served in Mesopotamia with the British cavalry, went on to become one of the most popular writers of thrillers and detective fiction.